April has been another jam-packed month, with some great events in aid of THHN and some really inspirational efforts by our fundraisers. We are humble and grateful to have such amazing support from local business and the people of Torbay. We have also welcomed more families, including several to our Memory Maker Caravan. For us, this is what it’s all about – making it possible to offer memory-making holidays to families whose lives are touched by bereavement and life-limiting illness. WOW is the only word to describe Hair Torquay, a breathtaking evening of hair, music and entertainment at the Venue nightclub on 1 May! The show was the brainchild of Tom Chapman, rising international star barber, educator and founder of the Lions Barber Collective, which aims to raise awareness of mental health issues in young men. 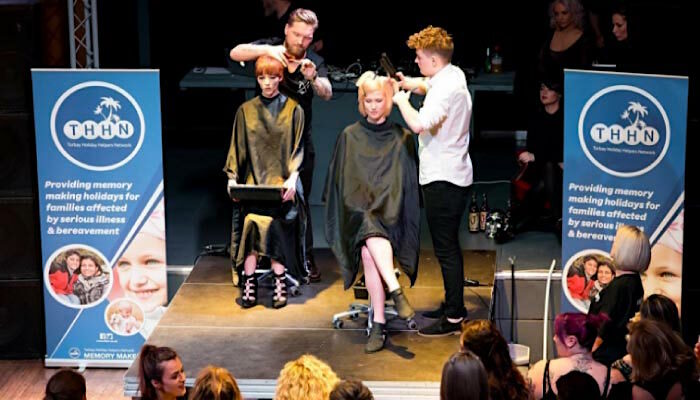 Tom collaborated with South Devon College, Kaboodles, No4 Hair Boutique,and James Beaumont to showcase the great work of stylists throughout the South West, and raise money for THHN and the Lions Barber Collective at the same time. We are incredibly grateful. THHN fundraising manager Brian Lewis took Memory Maker Man along to the Marine Hotel in Paignton to meet another superhero, manager Nicola Monkhouse. Nicola presented them with an envelope containing an amazing £1,600, the proceeds of the hotel’s festive raffles held during its Tinsel and Turkey Coach Tours. We are massively grateful to the Marine Hotel and all those who supported the raffles. Fancy joining team THHN for the Torbay Half-Marathon on Sunday, 26 June? There are still some charity places left. If you’re interested, please email brian@thhn.co.uk for details. If your running ambitions are a little more modest, why not enter the THHN Memory Maker Mile Fun Run? Open to all ages and costing £5, the Memory Maker Mile is a lap of Paignton Green, taking place on the same day as the Torbay Half-Marathon and run on closed roads in front of the half-marathon crowds. We promise it will be an amazing experience. To enter, go to www.thhn.co.uk/funrun. Huge thanks to sponsors Pennywell Farm and to Torbay Athletics Club for allowing us to organise the fun run. Fantastic THHN fundraiser Karen Bumby took part in this year’s London Marathon. This endurance challenge was the first of three that Karen has pledged to do to raise money for THHN. The others are the 30.1-mile Run to the Stones, Karen’s first ultra-marathon on 16 July, and THHN’s own City to Sea 55-mile ultra on 3 September. So far she has raised more than £800. THHN directors Luke Tillen and Martin Brook were invited to the Torbay Business Forum’s Pie and Ale Night at the Grand Hotel on 28 April, when an amazing £750 was raised for the charity. Ten new potential business supporters also came forward. It was a fantastic evening and we were delighted at the enthusiasm shown for our charity. A very big thank you to TBF for choosing THHN as its charity and for members’ incredible generosity. There are still fantastic opportunities for businesses to sponsor THHN’s City to Sea event in September. We are delighted to have been chosen as one of the 3 charities that will be benefit from a fantastic Cabaret Night at the Riviera Centre in Torquay on Saturday 15th October. The Cabaret Night is being organised by four local lodges and includes a 3 course dinner, they have a fantastic line up of acts appearing including Britain’s Got Talent contestant Steve Hewlett, Classical music meets pop with the singing duo Eden, Soul Singer Vernon Lewis and the compere is juggling comedian Steve Royle, who has made many TV appearances. So why not book your tickets now for this fantastic show. We would like to say a very big thank you to all the organisers of this fabulous event, thanks to them THHN will be able to help more families living with serious illness and bereavement. THHN super cyclists Chris Halls and Ross Mallen set off on 1 May on an epic 1,000-mile non-stop cycle ride from Land’s End to John O’Groats in aid of THHN. Sadly, Chris and Ross’s Long Way Up had to be halted at Chepstow after 280 miles and 17 hours, as Chris, who had an infection, was too ill to continue. They had raised about £2,000, with many sponsors standing by their pledges. Not ones to give up, Chris and Ross will be taking on the challenge at a later date – watch this space! In April THHN welcomed families to Buckfast Abbey, Vomero Holiday Apartments and our Memory Maker caravan at Finlake Park in Chudleigh. An enormous thank you to Riverford Home Delivery, Luscombe Butchers of Torbay, Halletts the Bakers, Claire’s Cakes, Daisy Cakes, West Country Fruit Supplies, Riverford, D&H Fisheries, Teddy Mountain UK and Project Linus UK for providing food, gifts and treats for the families to enjoy. Our sincere thanks also goes to all the other supporting businesses who have offered their services for free to ensure that these families who are living with serious illness or bereavement have a fantastic time! Last but not least, our heartfelt thanks to all our volunteers and staff who enable us to provide memory-making holidays that families touched by tragic circumstances are able to treasure forever.